Composting with worms (or vermicomposting) is becoming an increasingly common way to compost food waste at home. Put simply, a worm composter (or wormery) is home for worms with a perfect environment to encourage them to eat as much of your food waste as possible and turn it into compost (worm castings… the polite term for worm poo). By adding bokashi composting to the vermicomposting process, vermicompsters are able to compost all food waste. Items in the list above that cannot be directly added to the wormery can be put into a bokashi bucket. After the 2 week fermentation period, the bokashi pre-compost can then be added to the wormery, following the instructions below. Bokashi fermentation is an acidic process. The pH of the final bokashi product can be around pH 3-4; fairly acidic. Worms do not like acidic conditions, preferring a near neutral pH. Adding acidic bokashi pre-compost to a worm bin where the worms dislike acidic conditions sounds like a sure route to failure. However, bokashi pre-compost can be added directly to a wormery. In fact, many people have found that the worms love the bokashi food waste. The bokashi pre-compost is full of bokashi microbes that have worked on the food waste to make it soft and have started breaking it down. It may take the worms a few days to get used to the bokashi pre-compost. However, after adding bokashi pre-compost to the worm bin it breaks down in very little time. As with any changes to a worm composter. You should keep an closer eye on your bin when introducing bokashi pre-compost. 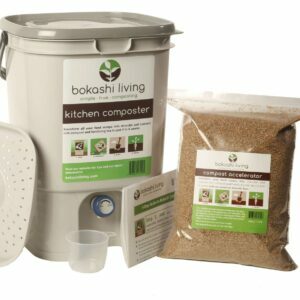 Here are a few tips for successfully adding bokashi pre-compost to your worm bin. Also, remember to add extra paper or other carbon source to maintain an appropriate carbon/ nitrogen ratio. 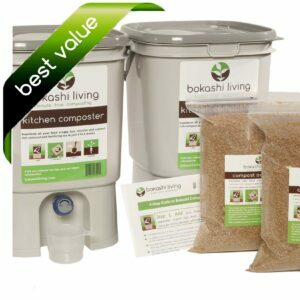 Adding bokashi will increase the acidity of your worm bin over time. Even if your worms get used to the bokashi food waste, they won’t thrive in an increasingly acidic environment. Add material to neutralize the acidity, such as lime. In summary, many people have had great success adding bokashi fermented food waste to their wormery. However, make sure to take steps to neutralize the pH to prevent an increase in the overall bin acidity.